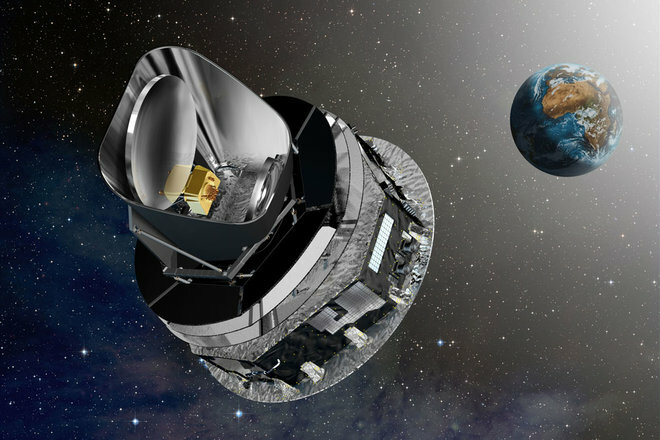 ESA (European Space Agency)’s Planck mission studied the Cosmic Microwave Background (CMB) fluctuations with an accuracy set by the fundamental astrophysical limits. In other words, it will be hard to beat the accuracy of the Planck measurements in the future. These measurements provide clear-cut answers to some of the controversies in theoretical physics. Ethan Siegel has a nice summary of the results here. The physical universe contains 4.9% normal matter, 26.6% dark matter and 68.5% dark energy. Planck observatory showed that there is more dark matter and less dark energy than the previous measurements indicated. Previously, dark energy was estimated to be 74% of the universe. Planck satellite measurements indicate that the overall spatial curvature of the universe is very close to zero. This means that in the absence of matter photons travel on a straight line. Don’t forget the caveat: in the presence of matter photons follow a curved path (gravitational lensing) as explained by Einstein’s theory of General Relativity. Planck satellite measurements are consistent with the inflation hypothesis but there is no evidence for primordial gravitational waves originating from the inflationary period. Planck collaboration measures the Hubble expansion rate as 67.4 km/s/Mpc. This number is lower than the number produced by the cosmic distance ladder method (73 km/s/Mpc). Planck results prove without any doubt that there are only 3 types of neutrinos. This is very important because this also proves that there are only 3 generations of fermions. Some theorists desperately seek the so-called sterile neutrino (4’th type of neutrino which would be heavy and right-chiral) but I don’t understand their motivation because the precision experiments at CERN in the 90’s (LEP experiments Aleph, Delphi, L3, Opal) also proved that there are only 3 types of neutrinos. This entry was posted in physics and tagged Planck satellite observatory. Bookmark the permalink.